Hi, Jen and welcome. Can you tell us a little about yourself? I live and teach Spanish in Chicago. I just started a new teaching job at Simpson Academy for Young Women. and go to used books stores. no matter if we are plant, animal or human. advance degree in science. She was the first African woman ever to win the Nobel Prize. She was the first woman to organize young poor women to 30 millions plant trees in her home country of Kenya. Yes! Yes! Yes! I love planting seeds and saplings. I hope all of your readers will plant a tree. There is a little trick to planting trees. When you buy a tree, there are always directions that come with how to plant the tree. I follow those directions. But I do two things differently. First when you dig the whole, make sure it is wide enough and deep enough. I always try and put a little compost in the hole to give the tree some boost. Finally when the tree is planted and the dirt covers up the roots, I say a few words of thanks to the tree and to life for connecting me to the earth. I know it sounds sappy but I feel like the trees I have planted have heard me. All of them thrive! If you don’t believe try it yourself! I've never planted a tree but I've said words of thanks to a few. So if that's sappy I am right there with you. How many times have you read Dr. Maathai memoir, Unbowed? I read Unbowed four times. The first two times I read her memoir for pleasure. I love Wangari’s cadence. She has such a graceful yet powerful way of stringing together words. I read the book two more times for research and once before I wrote the book and then afterwards to double-check my facts. What amazes me is how Wangari spoke to many different kinds of people from poor women to presidents, school children to ambassadors. Her words inspired all around her to action. You can feel her persistence and commitment in her speeches. Her words moved me from a passive watcher to an active doer. When she said Hajabee, Let’s work together, I understood it didn’t just mean turning off a light or recycling a water bottle but being aware of my actions and how my actions impact the world around me. I wanted readers to “hear Wangari”. I decided I would take every opportunity to use Wangari’s own words, so when the book is read, it feels as if Wangari Maathai is the room since the words belong to her. I loved the direct quotes. The reader isn't just learning about Wangari Maathai they are hearing her as well. How did you decide what to keep and what to leave out? This is a tricky line with big implications. But Lee & Low did not shy away from the truth, but like the life of Wangari Maathai, they stood firm. I will always be grateful to them for their deep respect for story and truth telling. Seeds of Change does its best to include the highlights of Wangari’s extra ordinary life. There are a few other great books written about Wangari that deal with only her involvement with the Green Belt Movement and planting trees. I wanted readers to see a deeper side to Wangari—from when she was a girl wanting to go to school to when she stood to give her speech in Oslo. All the things you just mentioned are the reasons why Seeds of Change stands out amongst the other children's biographies about Dr. Maathai. A good picture book biography is all about balance between facts and readability. You've managed to get it just right. What was your initial concern, facts or readability? I don’t think I thought in those terms. 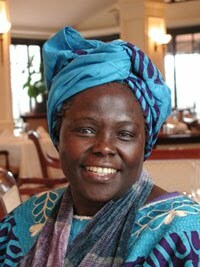 What first drew me to writing about Wangari Maathai's life was not the fact that she planted 30 million trees in Kenya but her persistence to find solutions for difficult problems. How do you conquer poverty without destroying the land? How do you preserve the land without disempowering the poor? Wangari took these two complicated issues, poverty and the environment, and found her own answer. Wangari taught poor women a very specific skill; how to plant a tree. By doing so the women planted trees all over Kenya, creating what looked like green belts across the land. The powerful image of green growing again in Kenya gave birth to the name Green Belt Movement. A movement, that thrives today as an international organization for the environment and the rights of the disempowered. I wanted Seeds of Change to reflect that fusion on passion and practice. Young people are smart. They understand how facts and storyline weave together. I was aiming for truth and with truth no matter how difficult or strange, comes beauty –or at least that’s what the Irish poet Yeats seems to think. This is the first time I've ever had the urge to read Yeats. Can teachers still get a free Skype Author talk or 1/2 off an school visit, if they purchase Seeds of Change? You bet. I love to visit schools. I like to have the students write about nature and then together go out and plant a tree in solidarity of the Green Belt Movement. As an educator, I know budgets have been cut and funding is low. If teachers or students buy a copy of the book, I will give them half off a school visit. I enjoy Skype visits and my author talks are free! If you want to try one, just go to my website for more information. I’d like to say thanks for this inteview. Doret’s passion for books and her desire to represent all readers-- no matter their race, creed, or gender—is like Wangari’s idea small as a seed that reaches the highest sky! 30 million planted trees. 30 million inspired readers! 30 million readers or 3. I may have inflated my visitor numbers a tad to get Jen to agree to do this interview. Though seriously I enjoyed Jen's answer as much as Seeds of Change. Her passion shines through. I love authors who are truly committed to telling stories they care deeply about. Originally posted at my personal blog. I checked Lee&Low is still having a sale.